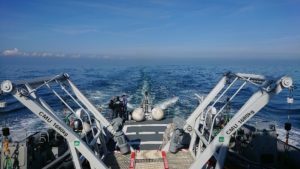 CMN Shipyard in Cherbourg, France, conducted sea trials on the 13th June 2018 on the OPV Thémis from the French Coastguard (Affaires Maritimes). 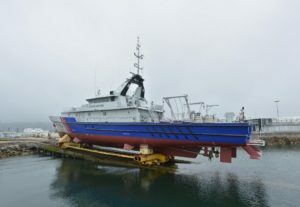 The patrol vessel received a hydrodynamic upgrade at the shipyard by retrofitting the patented Hull Vane®, an underwater wing which reduces the ship’s resistance. Comparison with the benchmark sea trials – conducted in January in exactly the same conditions – by CMN’s sea trial team showed a reduction in fuel consumption of 18% at 12 knots, 27% at 15 knots and 22% at 20 knots. The top speed increased from 19.7 knots to 21 knots. The Hull Vane® for Thémis is the eleventh unit built, but it’s the first one retrofitted on an Offshore Patrol Vessel, a ship type which Hull Vane BV expects to become one of their major markets. 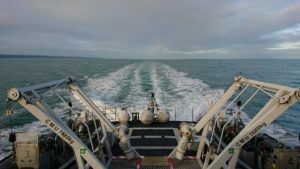 About a dozen studies and model tests have indicated similar savings percentages on patrol vessels, ranging from 25 metres to 108 metres. The Hull Vane® was built of steel in the Netherlands and was transported to Cherbourg by truck. CMN was in charge of the installation and the structural integration, including a lengthening of the divers’ platform. The influence of the Hull Vane® can be clearly seen in the modification of the wake behind the vessel, as shown in the images below, which show the wake before retrofit on the left, and after retrofit on the right. 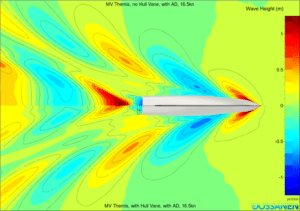 The results match very closely the performance predicted in CFD, by Hull Vane BV’s sister company Van Oossanen Fluid Dynamics. Model tests were not done for this project to save on cost and time. Thémis has a top speed of 21 knots, but most of the time she sails around 12 knots to save fuel. Taking into account the operational profile of the vessel, the annual savings amount to 20% of the fuel consumption, and of course the same percentage in emissions of CO2, particulate matter, NOx and SOx. For Hull Vane BV, this application is the first in France, where there is a huge potential in OPVs, naval ships, passenger vessels and offshore supply vessels. The company will exhibit at the Euronaval Trade Show in Paris, on booth I110, next to the CMN booth. Earlier, the company will also exhibit at the Seawork and SMM trade shows. The Hull Vane® is not only suitable for midlife upgrades, but can also be integrated in new constructions.